It is interesting to note where the kind of research I am doing is ending up in the real world. This technology from Siemens highlights the presence of speed limit roadsigns to the driver and interfaces with the cruise control system. Pretty cool. In the future, a system from Siemens that automatically recognizes speed limits on traffic signs will make driving even more comfortable — and help motorists to avoid speeding tickets. The system works with a camera in the car that scans the scene in front of the car for traffic signs and forwards the information to an onboard computer. With the help of the cruise control, the system then keeps the car within the speed limit. The risk of unintentionally driving too fast is particularly high when motorists are in unfamiliar surroundings or faced with road construction sites. 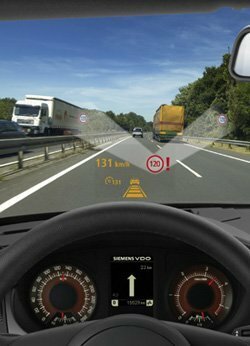 Part of a comprehensive network of driver assistance systems called pro-pilot being developed by the automotive supplier Siemens VDO, the traffic sign recognition system is scheduled to go into series production in about two years. Experts from Siemens have installed the system in a luxury class car, along with a host of additional assistance devices, including a lane recognition system, a night vision system and a parking guidance system. Several automakers have already tried out the test vehicle and expressed strong interest in the recognition system.